Just imagine you have for example a photo of a vehicle and you would like to use it as an 3D object. And maybe you would like to take this object, rotate it and and place it to another image. And it may be not only a vehicle. You can get 3D building, 3D face etc... How to do it? We will use the PhotoModeler Lite software - you can download it from this page . (You can find the link to this program on our download page for members - and we update it there when necessary). To start your work you need at least two photos of an object. For your first object we recommend something simple, for example a book. Later you can try more complicated objects, for example buildings, faces, vehicles etc. Every photo should show the object from one different side - the first one for example should be a front view, the second one a right view. If you use more photos then the third one could be a left view, the fourth one a rear view etc. Install the software and start it. Now choose Start New Project (from the menu). You will see a list of necessary steps - don't worry - it will be quick - just press Next. Now you should choose appropriate units for your object - for a book it is good to select centimeters (2.54 centimeters = 1 inch) - aproximately 40. Press the button Next again, choose A new camera, then insert any name, then a type (Digital is OK) and a model (for example Kodak DC 40). Now insert the size of your photos. The size of your pictures is limited in this version of the software, if you use standard jpg photos then the size 500 x 400 pixels should be OK. Next step isn't important and in the next one you will insert pictures to the software. Press the Add/Remove Image(s) button. Then use Change directory and select your directory with pictures. Then click in sequence to all the photos with the object (once again, for the first attempt we recomend to use only 2 photos) and to an arrow to the right - this will add the photos to your project. And now click to OK and Finished. Press SHIFT key and select all your pictures. And click to Open photos. Your photos should be now open and prepared for further work. Now you have to tell the software, where on the pictures is your object. Click to the button with a wand with 2 crosses (Line Mode - Ctrl + L). And use your mouse to select edges of your object. If your object is a book, then just click to it's first corner, then to the second one (both corners are connected now with a line, which marks the edge of your book), to the third one etc. You can stop selecting the object by clicking with the right mouse button - and later continue just clicking to any previously selected point. Select all corners (and edges) of the book - even the invisible ones (you have to estimate, where they are). Now do the same on the second picture. Before you start doing this, go to the menu Edit/Select All Marks. The object on the first photo will be selected. Click to the button with a twice crossed wand (Reference Mode - CTRL + R) and move your mouse to the second picture. In the first picture there should be marked the first point (it should be yellow). Select the same point in the second picture. If it is - for example - the right upper corner of the book - on its cover just beside the name of the book - it has to be the same point in the first and second picture. Select all the points in the same way. Now you can try to convert your object to 3D. Click to the button with a figure and press buttons Yes and Process. Accept it and close the window with a diagram. 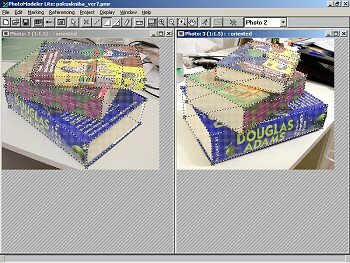 Choose in the menu Project/Open a 3D viewer, check Points and Lines and accept all other. Your object should be drawn now - but only with lines. If you try to click and drag with your mouse on one of the mark on the right bottom corner of the window, you will see how the object rotates, moves etc. Now close the window. Now you should give surfaces to your object. Click to the button with a triangle (Surface mode, CTRL + E) and in the first photo select all surfaces. These surfaces are triangles - if you want to select - for example - a rectangle then you have to select two triangles. Click in sequence to 3 points on one surface, then to another 3 points etc. Selected surfaces are marked with dots. Select all surfaces (even the invisible ones). You can move and rotate your 3D object as you wish. And you can create anaglyph from it as well. Just move the object to the right, press Print Screen, insert the screen to your graphic editor (menu: Edit/Paste) and save it as a left image. Now shift the object in 3D Viewer a little bit to the left (exact shift depends on the size of your object) and do the same again - but save the image as the right one. 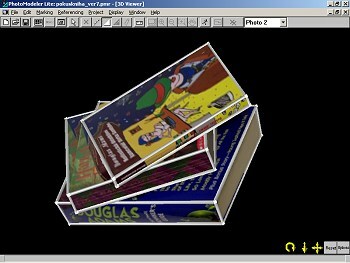 And now load the pictures to 3DJournal software and create 3D picture - anaglyph. You can export your object from PhotoModeler in a few different formats and use them in other 3D applications. And you can use the object in 3D collages as well.